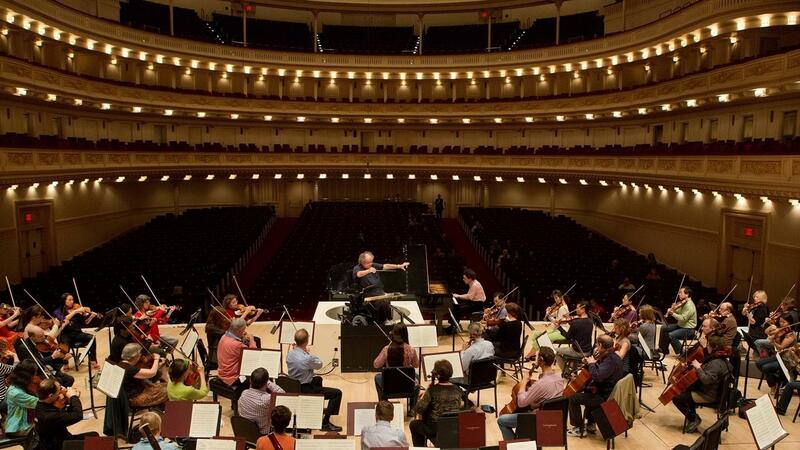 Conductor James Levine in rehearsal with Russian virtuoso Evgeny Kissin. An extended ovation greeted conductor James Levine last May when he returned to performing after a two-year absence. In 2011, he resigned as music director of the Boston Symphony Orchestra and cancelled his performances at the Metropolitan Opera. He'd been plagued by health problems, injuries and operations, and it was painful for him to move. Many of his admirers, even he himself, feared he might never conduct again. But last year, the Met announced that he'd be returning this year to lead three opera productions and several concerts with the Met Orchestra at Carnegie Hall. A special wheelchair had been rigged for him, and although he wasn't walking, he was evidently pain-free and his upper body was strong and flexible. We can hear his exciting return on Live at Carnegie Hall, a new two-CD set of that first Carnegie Hall concert, leading orchestral staples by Wagner, Beethoven and Schubert. The concert begins with Wagner's sublime Prelude to the first act of Lohengrin. Charlie Chaplin fans will recognize it from his anti-Nazi satire The Great Dictator, as the music during which Chaplin — as Adenoid Hynkel, the dictator of Tomania who is determined to rule the world — does a little ballet with an inflated globe. How could the music not be by Hitler's favorite composer? But Wagner himself described this music as a vision of angels carrying the Holy Grail. Levine's performance is visionary, floating yet forward-moving, a radiant and airborne hymn of thanksgiving. The Wagner is followed by Beethoven's most inward and profound piano concerto, No. 4 in G, with the celebrated Russian virtuoso Evgeny Kissin, who is an extraordinary technician with a gorgeous tone. But this music, a kind of dialogue between the introspective artist and the uncomprehending orchestra, is about much more than tone quality and technique. It requires a sense of musical and personal exploration. Kissin's performance seems more than a little precious. I wish Levine had chosen a more searching interpreter. Kissin is more satisfying in his encore, Beethoven's charming "Rage over a Lost Penny." The nearly hour-long piece taking up the entire second CD is why this set is a necessary addition to the Levine discography. Schubert's Ninth Symphony, nicknamed "The Great," is his most ambitious orchestral work, one of the most magnificent pieces in the entire symphonic repertoire. And this is one of Levine's most exciting and most nuanced performances. He lets this all-encompassing score unfold from funeral to festivity as a full and complex living experience. Since his return to active duty, James Levine has been getting rave reviews for conducting Mozart's Cosí fan tutte at the Met and for his second Carnegie Hall program, which featured a challenging major work by one of his favorite composers, the late Elliott Carter. He's also scheduled to conduct entire runs of Verdi's comic masterpiece, Falstaff, and Alban Berg's Wozzeck, one of opera's grimmest tragedies — the opposite poles of the operatic repertoire. Both Falstaff and Cosí fan tutte will be telecast in movie theaters in the Met's Live in HD series. There's been a lot of bad news in the classical music world lately, but the good news is that James Levine is back and at the top of his game. This is FRESH AIR. Conductor James Levine's physical ailments forced him out of circulation more than two years. But last May, he made a triumphant comeback, leading the Metropolitan Opera Orchestra at Carnegie Hall. That event is now on CD, and our classical music critic, Lloyd Schwartz, is very happy. Here's Lloyd's review. LLOYD SCHWARTZ, BYLINE: An extended ovation greeted conductor James Levine last May when he returned to performing after a two-year absence. In 2011, he resigned as music director of the Boston Symphony Orchestra and cancelled his performances at the Metropolitan Opera. He'd been plagued by health problems, injuries and operations, and it was painful for him to move. Many of his admirers, even he himself, feared he might never conduct again. But last year, the Met announced that he'd be returning this year to lead three opera productions and several concerts with the Met Orchestra at Carnegie Hall. A special wheelchair had been rigged for him, and although he wasn't walking, he was evidently pain-free and his upper body was strong and flexible. We can hear his exciting return on a new two-CD set of that first Carnegie Hall concert, leading orchestral staples by Wagner, Beethoven and Schubert. The concert begins with Wagner's sublime prelude to the first act of "Lohengrin." Charlie Chaplin fans will recognize it from his anti-Nazi satire "The Great Dictator," as the music during which Chaplin - as Adenoid Hynkel, the dictator of Tomania, who is determined to rule the world - does a little ballet with an inflated globe. How could the music not be by Hitler's favorite composer? But Wagner himself described this music as a vision of angels carrying the Holy Grail. Levine's performance is visionary, floating yet forward-moving, a radiant and airborne hymn of thanksgiving. SCHWARTZ: The nearly hour-long piece taking up the entire second CD is why this set is a necessary addition to the Levine discography. Schubert's Ninth Symphony, nicknamed "The Great," is his most ambitious orchestral work, one of the most magnificent pieces in the entire symphonic repertoire. And this is one of Levine's most exciting and most nuanced performances. He lets this all-encompassing score unfold from funeral to festivity as a full and complex living experience. SCHWARTZ: Since his return to active duty, James Levine has been getting rave reviews for conducting Mozart's "Cosi fan tutte" at the Met and for his second Carnegie Hall program, which featured a challenging major work by one of his favorite composers, the late Elliott Carter. He's also scheduled to conduct entire runs of Verdi's comic masterpiece, "Falstaff," and Alban Berg's "Wozzeck," one of opera's grimmest tragedies - the opposite poles of the operatic repertoire. Both "Falstaff" and "Cosi fan tutte" will be telecast in movie theaters in the Met's "Live in HD" series. There's been a lot of bad news in the classical music world lately, but the good news is that James Levine is back and at the top of his game. GROSS: Lloyd Schwarts teaches in the MFA program at the University of Massachusetts, Boston, and writes for the Web journal New York Arts. He reviewed "James Levine and the Met Orchestra Live at Carnegie Hall," a two CD set on the DG label. The Met will feature Verdi's "Falstaff" in its "Live in HD" series in movie theaters on December 14th. "Cosi fan tutte" will be featured on April 26th. GROSS: Coming up, in the spirit of the holidays, book critic Maureen Corrigan recommends some books she's grateful for. This is FRESH AIR. Transcript provided by NPR, Copyright NPR.